Guitarist who became a permanent member of the Welsh rock band Neck Deep. They released their debut album, Wishful Thinking in January of 2014. He previously performed with a band called Blood Youth, and was also part of the group Climates with Fil Thorpe-Evans. Originally a live guitarist for Neck Deep, he became a permanent member in December of 2015, replacing Lloyd Roberts due to allegations of sexual misconduct. He has two brothers. He began a relationship with British actress Holly Draper; but the two would break up in late 2017. 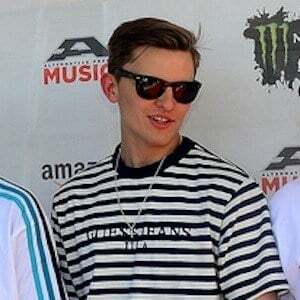 He joined singer Ben Barlow as a member of Neck Deep.